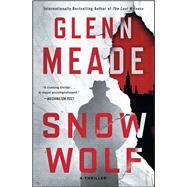 First published in 1997, Glenn Meade’s first internationally bestselling thriller is back and better than ever, as it takes you on a riveting ride into the heart of a Cold War plot to assassinate Joseph Stalin. It’s 1953—the middle of the Cold War. Joseph Stalin is a major threat—with his deteriorating mental stability, reports that he’s about to resume his horrifying purges, and the Soviet Union on the cusp of developing nuclear weapons, it’s a risk the US government is unwilling to take. Operation Snow Wolf is created to eliminate Stalin before it’s too late. CIA agent Jake Massey is chosen to run the operation and he recruits Alex Slanski—AKA Wolf—to do the deed, along with Anna, who recently escaped from a Soviet gulag, to be his guide. But someone knows their plan, and the KGB have dispatched their own deadly Major Yuri Lukin to hunt down the hunters. As circumstances quickly unravel, Jake must somehow put an end to the mission he had set into motion—before the entire situation explodes into World War III. Filled with breathtaking action and nail-biting thrills, this classic bestseller proves that despite being over, the Cold War can “still freeze readers’ attention and chill their blood” (Publishers Weekly).